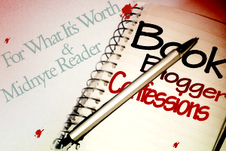 Midnyte Reader: Book Blogging Confessions - Vlogging (Monday, August 5, 2013). Book Blogging Confessions - Vlogging (Monday, August 5, 2013). Book Blogger Confessions is a meme that allows book bloggers to discuss issues unique to what we encounter in the blogging world. Every 1st of the month we will post a question and invite you to answer, comment and discuss opinions and different views. Vlogging. Have you ever vlogged (video blogging)? Why or why not? What do you think makes for an interesting vlog? How does a book review vlog compare to a written review in your opinion? What are a few of your favorite book review/author vlogs? (Source Amy Bookworm). Answer: I've done a few vlogs for In My Mailbox. Three to be exact. I haven't done one for a book review or anything else. For me, doing that feature was less intimidating than a review. First off, I think I'm a better writer than a speaker and I would probably just gush about a book over and over again. Plus you know, all those annoying "ums" and "likes." I don't want to subject anyone to that. Oh yes, I know that there is a thing called "editing," but I'm just not that great at it. Second, I think the feature was better for a vlog start because I knew what I wanted to say/do. Show books I acquired. I guess one could go into a review with a sort of script or note cards, but I just didn't. Also, perhaps I thought that a feature would get less views and is less important than a review and also would be shorter and I wanted to ease into it. To be honest, doing those vlogs was a huuuuuge step for me. I never in a million years ever thought I would do a vlog. I hate being in front of the camera. I think I just did it because I thought it would be fun and different. I think what makes an interesting vlog is someone who can speak clearly and express themselves. I'm not saying I'm an expert at that or even did that in my own vlogs, but that's what is interesting to me. I also love vlogs that are fairly short. It helps keep my attention. Good editing can also help with keeping a vlog shorter. Unfortunately, I was so bad with the editing software I didn't do this. I just showed my books in one take. I also love seeing people. It helps put a face to a blog and remember the blog. I also enjoy seeing people's book rooms, shelves or anywhere else they vlog. I think comparing a written review with a vlog is the same as comparing apples and oranges. They are two different animals. I guess with a written review you can go back and change things and correct your spelling and typos more easily. Also, it might sometimes be more interesting to the reader. They can just look at the review and see how long it is, see how it is formatted (characters, plot, etc.) and skim if they want. With a vlog you can certainly see how long it is, but it's hard to skim. However, with a vlog maybe you would say things that you wouldn't write and that might be something interesting for the viewer. With a vlog, you can show your enthusiasm and expressions perhaps more vividly than in a written post (even with the use of caps, exclamation points and gifs). I love Misty's (The Book Rat) vlogs. She does amazing editing and her vlogs are always interesting. Plus she has a beautiful voice! Savvy (Books with Bite) is also a good vlogger and Sarah (Just Another Story). If you are interesting in my short lived vlogging experiment, I've included the links here. I thought I did three, but I could only find two. How about you? Do you vlog? Would you consider vlogging? What do you like or dislike about vlogging? Let me know. I'd love to hear your thoughts! Labels: Book Blogging Confessions, vlogging. The whole idea of blogging just intimidates me. From the um's and likes to the technical aspect. I don't really enjoy watching them either unless they are really giving me a sense of the person. If it's too policed I lose interest and too amateur and I cringe. I guess they just aren't for me. I do agree with all your points...and am curious about your video experiments! I'll listen to them when I'm at home (my station at work doesn't have speakers). I was on Karen's page before I came here, and she announced that this was the last BBC installment, so to speak. I'm sad to see this meme go, for many reasons...but on the other hand, I understand her point - and yours of course, as the co-host. My farewell to BBC is posted under Karen's announcement, and I don't see the reason for posting a duplicate. But I want to thank you for co-hosting BBC and for welcoming me into it! It's interesting to read your post, seeing as I was just considering whether I wanted to blog or vlog my review of a particular book I just finished reading! I personally think that I am a better speaker than I am a writer (I hate writing! My finished product may be nice but the behind-the-scenes process for me to get there is very exhausting sometimes), but I also agree that vlogging is such a delicate art. It needs to be short, not too "amateur" with the ummsss and uhhsss, nicely edited (or nicely done in a single take if you don't want to edit), but when done well I really enjoy watching vlogs. I especially like when, as some of you mentioned, you get a feel for the person's personality through the video.... I am in awe of some of the youtuber's I subscribe to because their personas on camera are just so fantastic and entertaining.